Newberry is the Official Moose Capital of Michigan. There are more moose sightings in Luce County than any other county in Michigan. Make sure to visit our Newberry Lodging Page and stay with Quality Inn and Suites of Newberry. Make Your Next Vacation in Moose Country! Newberry is located in the heart of Michigan's Upper Peninsula. It is the Official Moose Capital of Michigan. 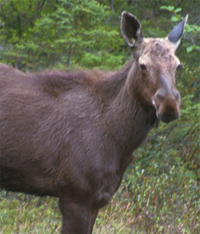 There are more moose sightings in Luce County than any other county in the State of Michigan. Make a trip to the Moose Capital of Michigan. It's a unique place set between the Great Lakes. 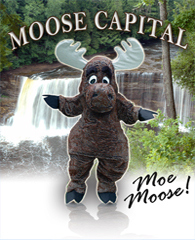 You may see a wild moose or perhaps our mascot Moe Moose! Make sure to check out our wonderful accommodations under our Newberry Lodging Page and stay with Quality Inn & Suites Hotel of Newberry. Tea-colored water from the bay. His antlers oh so wide. I searched out a place to hide. I had no further fear. But man, he was big for a deer! Was their magnificent Moe the Moose! This is Moose Country and we invite you to discover the beauty and majesty of our area. Check out our entire website to explore the many year-round activities that you can enjoy right here in the Moose Capital! In 2002, the House and the Senate declared that Newberry Michigan would be recognized as the Official Moose Capital of Michigan! and stories about their own personal encounters with area moose to the Chamber. It was a proud day for the Tahquamenon Area. Most sightings do occur in the Tahquamenon State Park and north of Newberry. The area and terrain is a perfect setting for the lifestyle of the moose. Planning a trip to the Moose Capital? Make sure to check out our wonderful accommodations under our Newberry Lodging Page and stay with Quality Inn & Suites Hotel of Newberry.